I returned from Williston, North Dakota yesterday and racked my wife’s Blue Moon Clone over into the secondary. It was a couple days later than I wanted but, based on the gravity ready and the taste of the sample pulled for the reading…..it will be a good beer. The gravity had dropped to 1.008 – very nice and it would have been more meaningful if I had remembered to get the original gravity. Beer Smith brewing software estimated the original gravity to be 1.053 and final to be 1.018. I am well below the estimated final gravity so I suspect my original gravity may have been on the low side of the estimate. In a few days, as it settles and clears a little more, off it will go into the minikegs and bottles. I just read through the top 50 commercial craft beers in the US as voted by the members of the American Homebrewer Association. By my count I have had 23 of the top 50. I apologize for not having tried hard enough to score higher. My newest “favorite IPA” was tied for 49th, Odell’s IPA. I believe as the distribution for Odell’s widens it will move up. If you can run down a sixer….and you like IPAs’, buy it and enjoy. These same folks ranked brewers as well – of the top 25 I have sampled beers from 14 of them…Still have to work on better form. I think I need a plan for the second half of 2014! I will be in Chicago for a week in August so I expect to sample that market! I will be in the Paso Robles area soon and will visit the number “7” ranked brewery, Firestone Walker. It is home to my “personal” number one ranked beer, their barrel aged Russian Imperial Stout, Parabola! Included in the article are recipes…clone recipes that are very tempting – One is a clone for an “All Day IPA” from Founders Brewing Company in Michigan…it comes in at an ABV of about 4.7%. The number one ranked beer, “Pliny the Elder” from Russian River in California is also included with a clone recipe. It is a heavily hopped IPA that comes in at 8.2% ABV and an amazing dosage of wonderful hops! What shall a man do? Maybe both???? I have to get my wife’s beer bottled and out of the fermenting chamber. I can only ferment 2 – 5 gallon batches at a time. If I only had a bigger chest freezer! Hmmmmmmm I wonder if Santa would say that I have been a “good enough” boy this year? I have to give Firestone high marks for the beer and also for the food offerings at the Pub. Here I am trying to balance calories in vs. calories out and fortunately Firestone makes it a doable task. I am not going to order a Coors Light, not a bad beer but, after all, I am at a nationally recognized Brewery so I need to take advantage to the opportunity….a full flavored and FULL calorie beer….Like the “Wookie Jack”. Well since I was there I decided to order a 3 ounce taster of one of the very best Imperial Stouts made in America. I have tasted it before and I agree. Dang it…..not on tap on the night of my visit…..I was tempted to order a “Bomber” – 22 ounces to take with me….12,5 % ABV, complex wonderful flavors….sipped and enjoyed like a fine port…BUT $ 55.00 for a bottle…..now way! I suffered, but not much….The Wookie Jack was superb! The food pairing for me was a very nice piece of Pacific salmon, wonderful steamed spinach underneath it. Portions were just right….allowed me the opportunity to enjoy a great beer and not bust my calorie budget for the evening! On top of that, the absence of the Imperial Stout, barrel aged for a year was mitigated by the fact that I have in my possession the 2011 bottling of this barrel aged stout….waiting for the right occasion to open and share….as is my bottle of 20-year-old Pappy Van Winkle bourbon! I am accepting bids – contact me if you would like to make an offer on either bottle! I did branch out and try another local beer, Tap It Breweries IPA. Brewed in San Luis Obispo. I was pleasantly surprised….I need to check out more of their offerings on a future trip. My buddy Gary has decided that Firestone’s 805 Ale fits nicely in his wheelhouse……multiple times. I have to admit…It is a good one but my preferences run toward higher IBU’s……International Bittering Units, i.e., HOPS>>>>>I love hoppy beers. 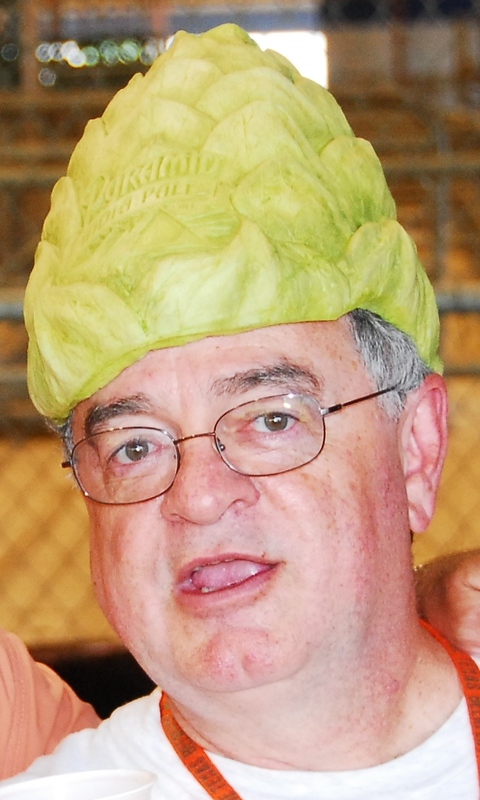 Not me…..but this is a Hop Head I ran into at the 2011 Humble, TX beer festival. A real, true Hop Head….Literally! My Golden Wheat Red IPA is disappearing too quickly so I decided to brew another batch, albeit with a tweak to the hopping schedule. The plan was to increase the hops, change the schedule up and see how it lands. There was a significant goof on my part, I was going to stay with the Amarillo and Cascade hops mix I used previously. I went to the Beer store in Humble(Backyard Homerbrewers and Education Centre) to pick up the ingredients from my pre-prepared list. Picked up the ingredients and headed home. If you look closely in the photo you will see a package of Centennial hops, not Cascade! The dummy at the store fouled up, or so I thought. My list was still in the bag so I looked at what I had written……Hmmmmm, where was my brain, I was thinking Cascade and wrote Centennial! I got what I wrote down – I guess I was the dummy. Most everything stayed the same….except for the hops and the hopping schedule. 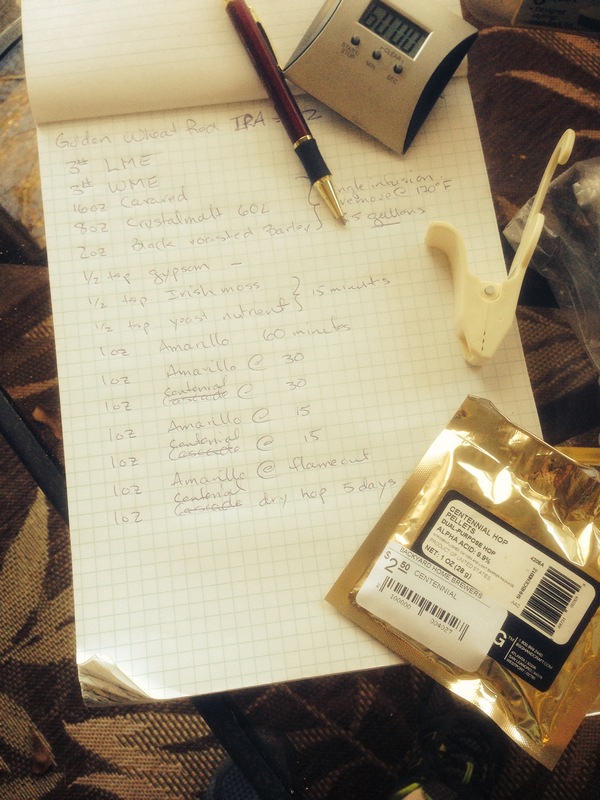 1 oz Centennial used for Dry hopping planned for the secondary – 5 days then crash to 34 degrees for a couple more. The Original gravity of my first batch came in at 1.066, this one, using the same grain bill and extract is 1.040 – a significant difference. It could be I was shorted or I bought slightly different ingredients from my local store. The first batch ingredients were purchased from the cross town store Defalco’s.. 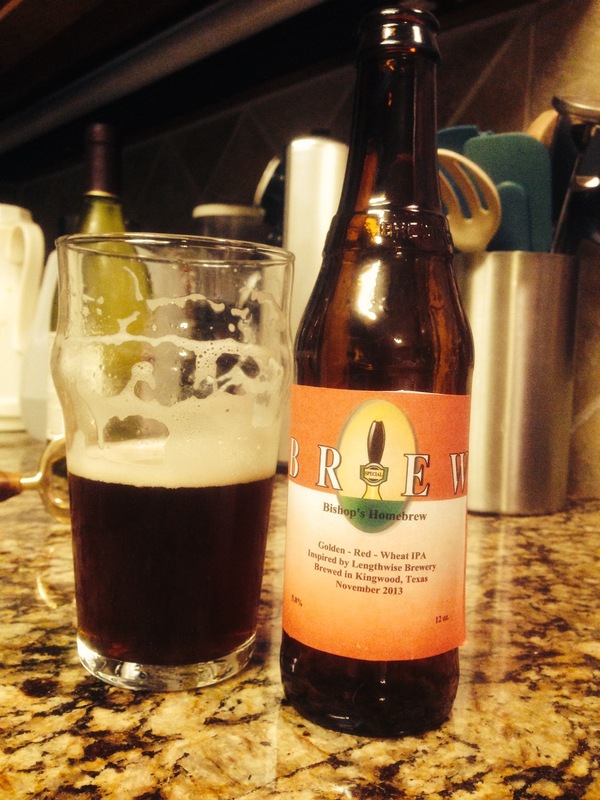 The color is also notably lighter – may have to try brewing this again real soon! The beer is in the fermenter at 62 deg. F for a week and will then be transferred to the secondary and dry hopped…. Is it true that there are no bad beers? Just some better than others? Well the jury is now returning the verdict…..the beer is PDG! I benefitted by several weeks away from the temptation of sampling the beer too early. I have to admit that I did sample one before I left, I knew it was going to be too early and yes it was….In need of a few more weeks of conditioning……so, that is what I gave it! December 19th, 2013, I tried the second bottle of the batch. Wow! Very nice head, the aroma was/is amazing and the Amarillo hops used for the dry hopping have left its signature citrus note! The color is a bit darker than I had anticipated. It is a darker red than planned, but is very clear and refreshing. My daughter Lisa was over when I poured that “second” first beer. Her comment was, “It tastes light, not dark like I thought it would be”. Nice lace on the glass so I sat back and enjoyed being home, looking forward to the Holidays and spending time with family! The Beer, The Bottle and the Belch….not really! I shared a few bottles with my buddy John. We sat and watched a little football yesterday enjoying my latest offering. He was highly pleased…..”it is a keeper recipe” was the proclamation. I had to agree with him but the wheels were already turning – it is good, but maybe I can tweak the hopping schedule and make it great! Oh, Thanks again to Lengthwise Brewery in Bakersfield for the inspiration! I subscribe to a weekly online post called the “Weekly Pint”. Always informative and usually entertaining. Last January an article caught my eye – drinking a hoppy beer like my preferred style, IPA, may reduce the chances of catching a cold. I love it when I can tout the health benefits of drinking beer….. The winter cold season is approaching so…..What do we need to do? Read on and find out. I dove in to the article, as I read further I realized that I needed to temper my enthusiasm! The promising research showed that ingesting large amounts of humulone, a key ingredient in hops, the best part of my preferred beer style – see above in case you forgot that I love IPA’s of all kinds, yes some more than others – nonetheless they are all good, can actually be good for your health (a lengthy run on sentence). So how many IPA’s would I need to pound down to fend off Respiratory Syncyital virus? Just 30 beers at one sitting would provide enough protection to ward off the virus. Dang it….that would definitely max out my daily intake limits by – hmmmm somewhere in the neighborhood of 10 times. Let’s hope that the researchers mentioned in the article will find more benefits of hops – in a more practical dosage! Humulone and its “cousins” adhumulone, cohumulone, prehumulone, and posthumulone are α-acids found in the resin of hops (Humulus lupulus). They are precursors to iso-α-acids, the predominant contributors to bitterness in beer. H. Bungener isolated humulone from commercial hops in 1886, but it wasn’t until 1970 that D. DeKeukeleire and M. Verzele determined its absolute configuration.” Facts from Wikipedia – a most trusted source! Now you know……. probably mare than you wanted to know! As a bar trick you could use the information above to draw the molecule on a bar napkin and impress all of your friends!